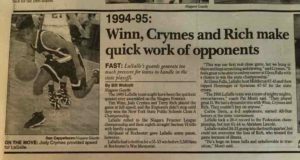 This is part two of my interview with legendary LaSalle Senior High School point guard Tim Winn. 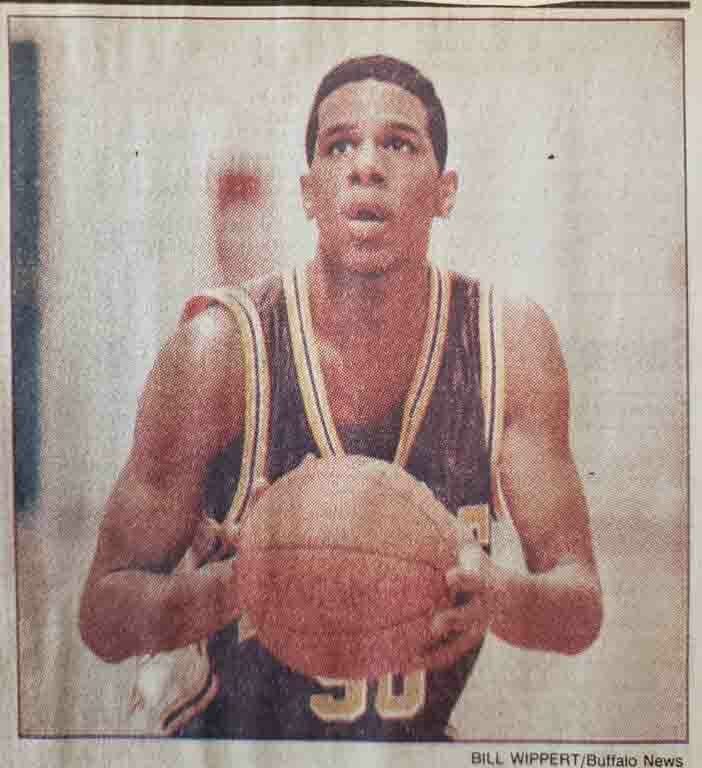 In part one, we discussed his background, how he started playing basketball and how he became a LaSalle Explorer. 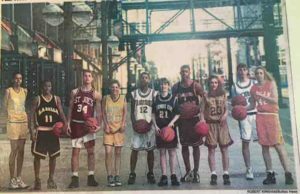 In part two, we talk more about playing in the LaSalle basketball program, where Tim played college basketball, the closing of LaSalle Senior High School, and finally, how basketball has changed. 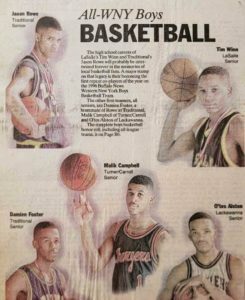 The pictures in this interview come from an archive of Western New York basketball assembled over the years from issues of the Buffalo News, the Rochester Democrat & Chronicle, and Sections V and VI playoff programs by my first Coach at Hutch-Tech High School, Dr. Ken Jones. Other pictures were generously shared by Tim himself, and his Head Coach at LaSalle Senior High School, Pat Monti. Click on any of the images to enlarge them. 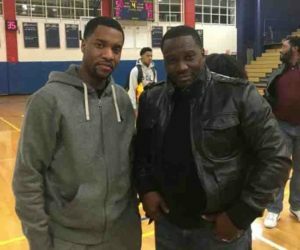 Anwar Dunbar: So, with your team having its eyes on Glens Falls the entire time, it sounds like even though you were getting everyone’s best shot every night, you weren’t very concerned with any of the other Section VI teams. 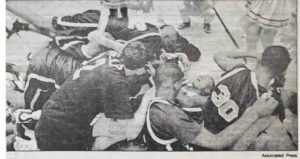 Tim Winn: Don’t get me wrong, there were a lot of tough teams in Western New York, but there wasn’t one game there that was going to take us up too high, or take us down too low no matter what the results were, because our goal every year was Glens Falls. It’s like the Cleveland Cavaliers right now. Yes, Boston is tough, but for the Cavs it’s championship or bust. Once you get to Glens Falls a couple of times, you’re not accepting anything else. No matter what the ups and downs are during the year, your eyes are still on that prize, and it’s all that really matters to you. AD: Were there any games in Section VI that you had circled? Niagara Falls High School, for example. That was a ‘rivalry’ game wasn’t it? TW: It was a rivalry game. It was great for the community. You can compare it to St. Joe’s, Canisius. For us it was a great game. It brought the community together. You might be playing some of the most intense basketball against one of your cousins. You had family at both schools and everyone came out. It was probably one of the best traditions our city doesn’t have anymore. We looked forward to playing against St. Joe’s. Obviously Buffalo Traditional, the team played them my senior year, but I didn’t because I sprained my ankle working on my jump shot in an open gym. Everyone in the world was waiting to see that game. AD: So, Tim, what was your game? Were you a penetrator? Could you eventually do everything offensively? TW: By my senior year, I could do everything. My staple though was defense. I would lock anybody up – that’s just how I felt. I was 5’9” and 165 pounds, but my heart was as big as Isaiah Thomas’. Coach Monti put me on anybody and it didn’t matter their size – I was locking them down. That was my greatest skill set by far, and it was probably the most aggressive part of my game for my entire career. I didn’t develop what I would call a ‘well-rounded’ offensive game until my senior year in high school, and that’s with me averaging 23 points a game as a junior. At that point I could get to the basket and I could shoot; whatever the game presented to me. AD: What kind of student were you while you were playing for LaSalle? It didn’t matter who you were, you were held to these standards and there was no favoritism. You were going to walk a certain way, and you were going to carry yourself a certain way in the classroom. School was going to be more important than any state championship, and if not, then it may not have been the program for you. AD: So Coach Monti was actively monitoring your grades then? TW: Everything. He monitored how many steps you took down one hallway. It was the best thing that ever happened to me – to have someone care about your development that much as a young man. It wasn’t just about basketball – he treated all of his players like family – like his sons. AD: Was there a particular quote he used to tell the team regularly? TW: No, there wasn’t necessarily a quote as much as it was a philosophy. You just knew when you were dealing with him, you had no choice but to walk the straight and narrow. There is a lot of structure that young men need that a lot of them don’t get these days. You knew that if you weren’t handling your business in the classroom, you had a problem on your hands and you did not want to make it to his classroom. That type of program for me and my teammates was everything. 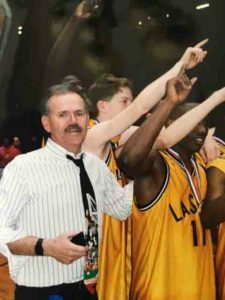 You still hear guys talking about it right now, ‘If Coach Monti was here, if Coach Monti was in the Falls,’ just because of what it did for us. AD: When did the colleges start recruiting you? TW: I think I started getting recruited in my sophomore year. During my sophomore year all the local schools started recruiting me. The summer after my sophomore year, after we made it back to Glens Falls, it picked up because I went to a couple of camps where I did pretty well. I’d say beginning to mid-sophomore year and onward. AD: Which schools came calling? TW: I turned down Syracuse and Georgia Tech. Amongst my circle, we still talk about it all the time. I was ‘signed, sealed and delivered to Syracuse,’ but the young and naïve me not having anyone else in my family who went through the experience, I pulled out of it at the last minute. I remember being at the State Fair in Syracuse and I was supposed to go verbally commit. 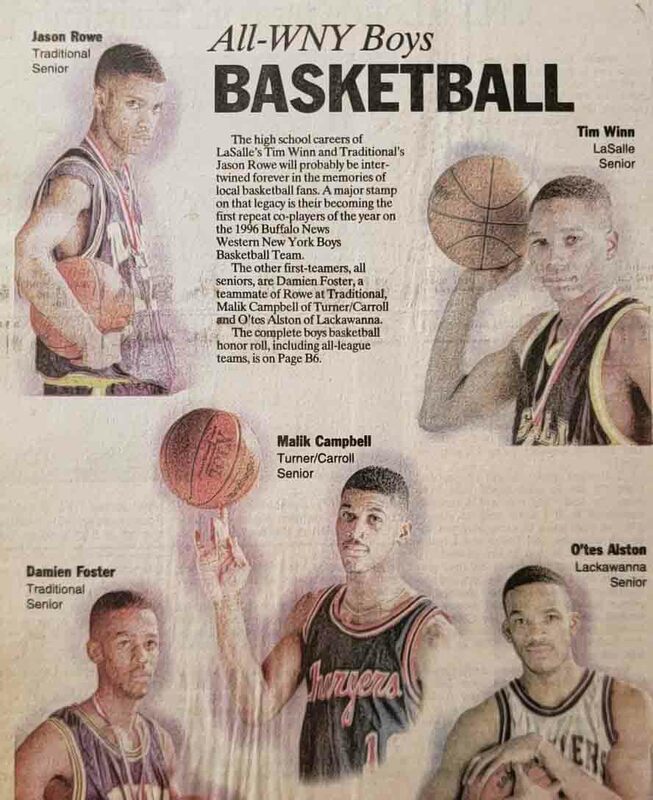 My friend, Romell Lloyd, went the next year and Malik Campbell (Turner/Carroll, pictured below in the All-Western New York photos) was at the Fair at the same time. We were all supposed to go, but I pulled out at the last minute. AD: Why didn’t you go? TW: It was a last-minute change of heart. 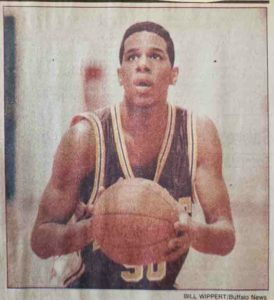 Rob Lanier had watched some of my games at the ABCD Camp and I told him that I was still open, and then St. Bonaventure started recruiting me. AD: Did you talk to Coach Monti about it? TW: I didn’t and that was the young me. I didn’t tell anybody about it. He’s from Syracuse and I know for a fact he wouldn’t have let me pull out of going to Syracuse. It’s one of those things. I don’t have regrets now, but as an older man, sometimes I think about it. AD: So you went to St. Bonaventure. I remember seeing you on TV. 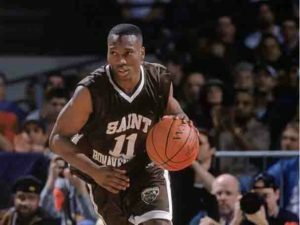 What was it like playing at St. Bonaventure? TW: Anytime you go to college and away from home, there’s going to be an adjustment. I sold my family on my not going to Syracuse and going to St. Bonaventure instead by telling them that, ‘I can go to Syracuse and be expected to win 20 games every year, right? I can win 20 games there and go the NCAA Tournament and I’m just one of the guys. 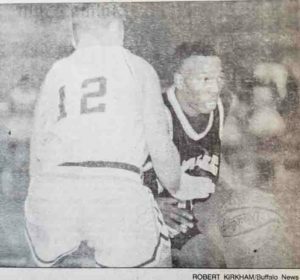 St. Bonaventure hadn’t been to the NCAA Tournament in 30 years, and if I can get them there, I’ll be a legend.’ It meant more to me to leave that type of legacy behind. AD: Did you play all four years? And did you make it into the NCAA Tournament? TW: We made it my senior year. We played Kentucky in the opening round. It went into double overtime. AD: What Kentucky team was it? Was it one of Rick Pitino’s teams or was it one of Tubby Smith’s teams? TW: It was one of Tubby Smith’s teams. They had Tayshaun Prince, Keith Bogans, Jamaal Magloire – those guys. 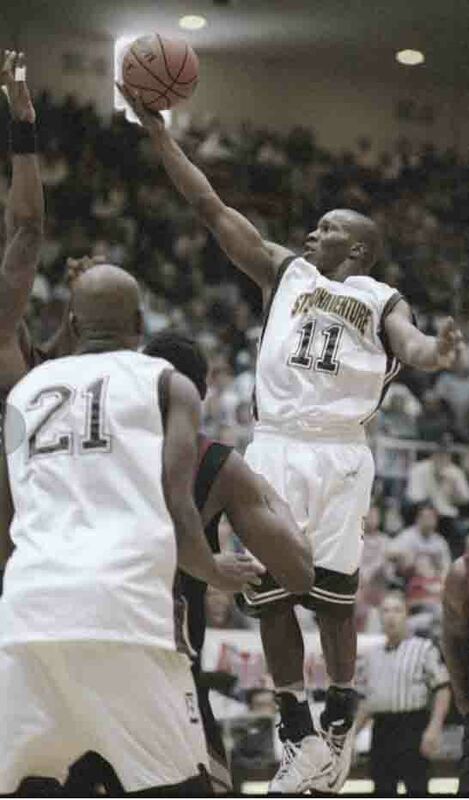 AD: By the time you were a senior were you leading the Bonnies in scoring or assists? TW: I think my junior and senior years I was leading my team in scoring, assists and steals. 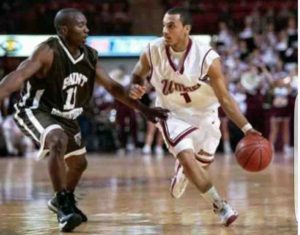 In my junior year, I was second in the nation in steals behind a guy named Shante Rogers from George Washington University. AD: So you said you learned the most basketball at LaSalle. Was it an easy transition to go play for Jim Baron at St. Bonaventure? TW: It was. The only adjustment was getting ‘college-strong’, getting my body on the level. There wasn’t anything that I wasn’t prepared for, so it was just a matter of getting up under one of those weight programs and getting my body to catch up with my mind. AD: What did you major in at St. Bonaventure? 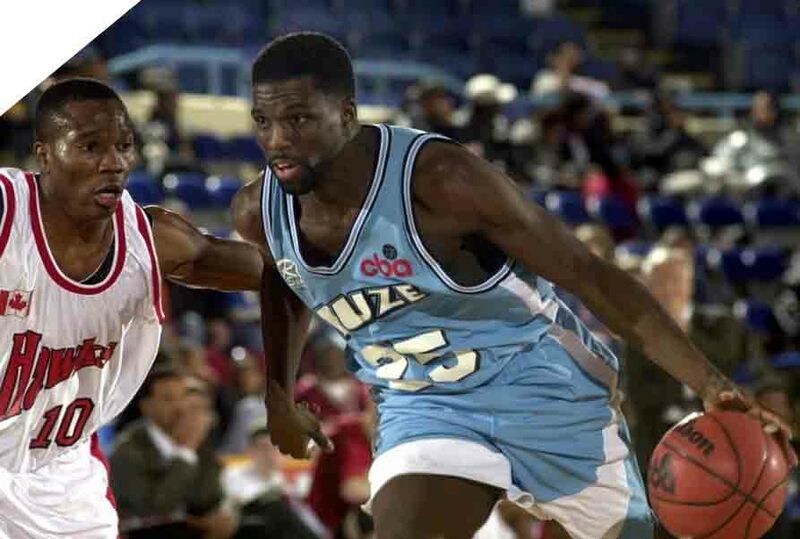 AD: Beyond the college level, did you play any professional basketball? TW: I pretty much played in the minor leagues over here. I played in the Continental Basketball Association (CBA) and the American Basketball Association (ABA ), and then I played in Germany, France, Venezuela, Canada, England – so I’ve been around a little bit. 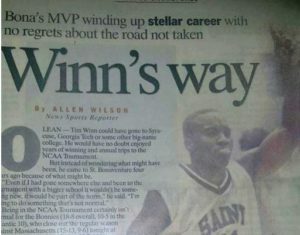 AD: I know a highlight for Jason was playing against Allen Iverson. Were there any particular matchups that stand out to you? TW: Tim Hardaway and I were teammates for an All-Star game in the ABA. For me, Tim Hardaway is a pretty big deal. I’ve played with Olden Polynice. I’ve also played with Keith Claus. I’ve played a bunch of guys who played in the NBA, who came down to the minor leagues. AD: How many years did you play Pro-ball? TW: I stopped playing in 2007, so about seven years. I could’ve kept playing, but I chose a ‘regular’ life to put that degree to work. AD: Were you getting tired of all the travel? The sleeping in hotels? TW: It’s very tiring. The minor leagues are a year-round job and there’s really no offseason. It gets tiring after a while. You don’t have the NBA’s budget to take care of your body so it got taxing after a while. AD: What career did you settle into when you left basketball? TW: I was the Vice-Principal in a school in Buffalo called “Sankofa Charter School”. That came through a basketball connection. I did an appearance at the school. The kids liked it, and I was asked to become the Dean of Students which was the equivalent of being the Vice-Principal in the charter school environment. I did that for a couple of years and the school closed. Then I moved my family to Charlotte, NC. AD: Are you still involved in the game in any way? Are you coaching an AAU team? Do you still compete in any way? TW: It’s crazy. I’m cold turkey. I’ve been asked on numerous occasions to help coach AAU. Jeff Bishop is down here and he’s asked me on several different occasions to help him out with his AAU program. My son plays baseball and is nine years old, so I really don’t have the time to dedicate to something on that level. I wouldn’t want to cheat a group of kids by me not being there consistently. I don’t play at all and all I have left are old stories (laughing). TW: And I’m cool with it. AD: Yes, it sounds like you’ve done just about everything with basketball. Going back to the LaSalle days, do you remember what your best game was? Was it one of the state tournament games? Was it one of the Niagara Falls games? TW: It was a bunch of games. Locally, I gave Turner/Carroll 39 points, and that’s a big deal because Antoine Sims was always a great competitor and to have a great game against Turner/Carroll and that caliber of player, it’s going to stay with you for a while. 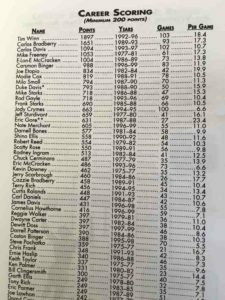 I had 52 points in a game which broke Carlos Bradberry’s record; regarding records that was a big deal. My senior year in Glens Falls in the semifinal game, I scored 35 points. We were down big in the fourth quarter and then scored 39 points as a team to come back and win to advance. It was a big stage and that was against Hempstead who beat us when Carlos was a senior, so it was a little bit of payback. AD: Of all four of your years, was there one that was your favorite? TW: Easily. It was my junior year by far. 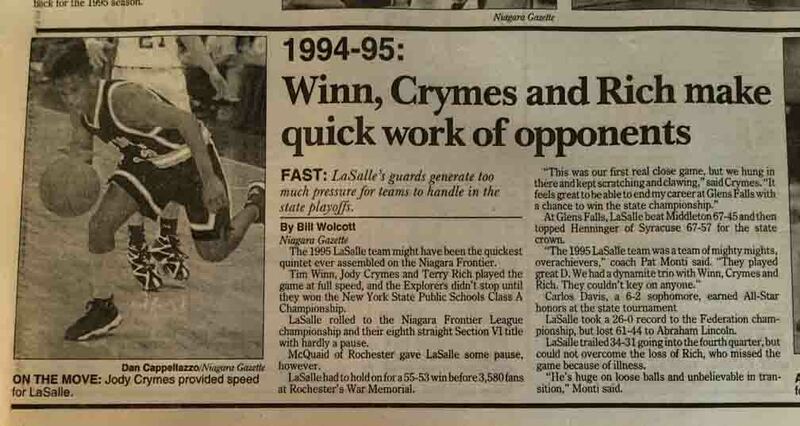 We had a three-guard lineup and as humble as I can be in saying this, there was not another guard combination in Western New York who could stop us. You don’t really feel it when you’re in it, but now that I’m older and I’m watching the tapes, it’s just unreal to watch that team and those three guards – me being one of them. You couldn’t key on me because Jody Crymes would give you 20 points. You couldn’t key on Jody because Terry Rich would give you 20 points. We were a well-oiled machine, and I think all three of us had over 100 steals apiece that season. It was a lot easier than my senior year. AD: And you guys were able to nullify any height advantage your opponents had? TW: That was our thing. You might have height, but could you run? And then, can your guards get you the ball? We didn’t lose sleep playing guys who had players 6’8” because the chances of them getting the ball over half court were slim to none. AD: Was there anything that surprised you during your time at LaSalle? TW: I didn’t really know how to score until I played alongside Carlos Bradberry (pictured to the left). Prior to that, all I did was steal a bunch of different skill sets from a bunch of different players who came before me. I put my attitude and personality behind me, figured out where I still had weaknesses and worked on it. Playing with Carlos my freshman year, taught me how to score; just watching how he would get buckets. 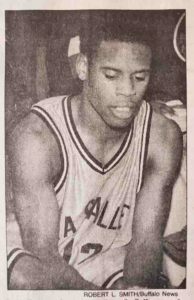 I may be the all-time leading scorer in LaSalle’s history, but I had 500 steals. Carlos had at least 1,600 points, but they were straight buckets. I keep mentioning Modie Cox – knowing that he’s in the program and living a couple of houses down from me as well – being able to watch that and watch him lead a team as a young kid meant a lot. In my junior year, we were in the semifinals in Glens Falls. Jody Crymes came down on four different possessions and scored. I’ve never been in a game where someone else besides me said, ‘We’re not losing today.’ It was one of the ‘awe-moments’ for me. 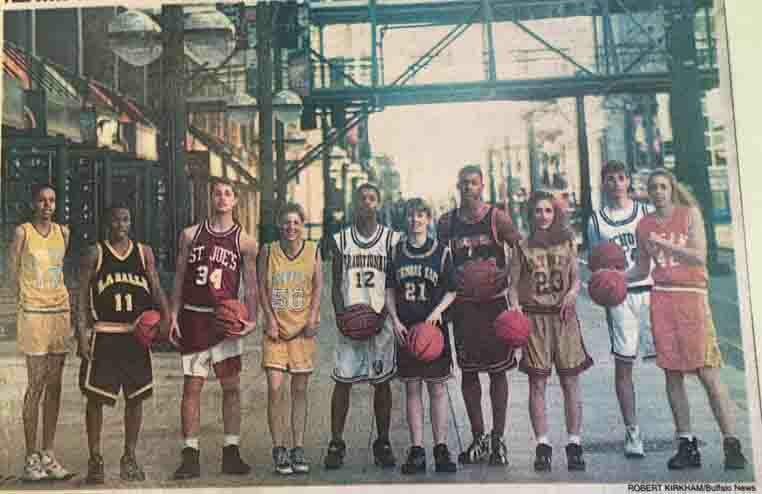 AD: I remember trying out for the Empire State Games in my sophomore year. Jody (pictured to the left) showed up with Curtis Ralands. I was on Jody’s team before the first cut. He was lightening quick, and on one play he penetrated down the lane and I followed him down the lane looking to get a potential offensive rebound. He threw a no-look pass behind his head to me, and I didn’t expect it so it sailed right passed me. He turned around and looked me with an expression like, ‘What happened?’ I wasn’t used to playing with that caliber of player, and you guys played at that high level, and I can only imagine the three of you on the floor at once. You went to Glens Falls all four years. For kids who never went, what’s the experience like? TW: I guess when you win a lot, you don’t know what it’s like to not be in the environment that you’re in. I never experienced a down-time or a losing situation. To not know what it’s like to be in front of a packed house, to not be in the hotels, to not go to Glens Falls, I’ve never experienced that. Not going would’ve been a failure for us. So, for me it was what we were supposed to do, and it was how we were supposed to be treated. The message was, when you win, this is how it’s supposed to go. AD: That’s fascinating because there were many kids who were happy just to qualify for the sectionals, but for you and your team it was getting to and winning in Glens Falls. Otherwise, it wasn’t a successful season. So, there’s something here about where you set your sights and what you shoot for. TW: If we had lost in the sectionals it would’ve been the biggest tragedy for our program ever. Once we beat the Rochester team my freshman year (McQuaid Jesuit) in the Far West Regional, it moved to that, and I felt like we were never not going to play in this game. We knew what it felt like to win that game, and we knew what defeat felt like because John Wallace’s team (Greece-Athena) beat us the year before. Being an eighth-grader and being exposed to that game, I felt like one day I would be the guy to lead us. AD: There are whole generations of kids who know nothing of the LaSalle Explorers except in legends and old wive’s-tales. Where were you when you heard that they were going to close and demolish LaSalle Senior High School? How did you feel when you heard it? TW: I’m still in disbelief. So much tradition came through there, and so many success stories; not just basketball, but in general. Imagine that you buy a house and it’s in your family for 30-40 years and then you come home and the house is torn down. It felt like they tore down the house that’s been passed down for generations in our family. I’m also bothered by the fact that when they combined the schools, Pat Monti wasn’t named the Head Coach of the Varsity program. That let me know that there is a gift and a curse to winning all the time. AD: Okay, we’re speculating here, but does that mean there was some sort of conspiracy to keep Coach Monti out? TW: It’s all politics. How does the best basketball coach in Niagara Falls history not get that job? He was the best coach to come through the city, one of the best coaches in Western New York. He’s in four to five different halls of fame. It’s one thing to close the school down, but to bring politics into the equation and not give him the next job? It wouldn’t have hurt as much if he had gotten the next job because the tradition would have still been in the city. Since LaSalle closed, there’s only been on state champion out of Niagara Falls, and that’s when my little cousin Paul Harris and those guys won it. That’s the only state championship since we closed. But if you look at the rosters at Niagara Falls High School since LaSalle closed, they should have at least six or seven state championships. AD: We can keep this off the record, but do you think there were parties that were looking at all of Coach Monti’s success and felt that you all had an unfair advantage, or were they just ready to see the brown and gold go away? 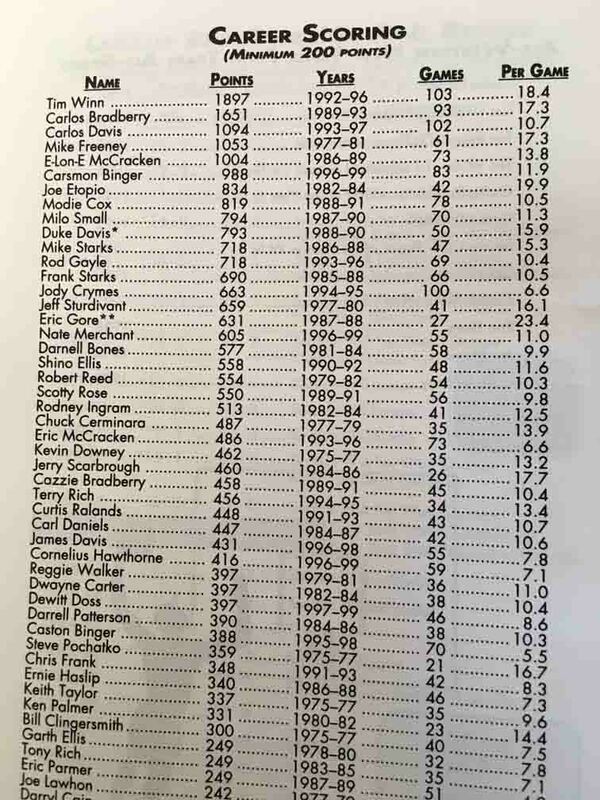 TW: As great as Coach Monti was, the people he beat up on all the time didn’t like him. Imagine being beat for years. Just think about our rivalry with Niagara Falls High School. I think we won 40 or more straight games from the late 1980s until the school closed. All of the coaches and superintendents who are responsible for the new school opening were not going to let him be the coach after kicking their asses for all of those years. AD: Well I did ask Coach Monti that – were all the other coaches happy to see you go once word got out? He laughed. We have a few more questions, Tim. 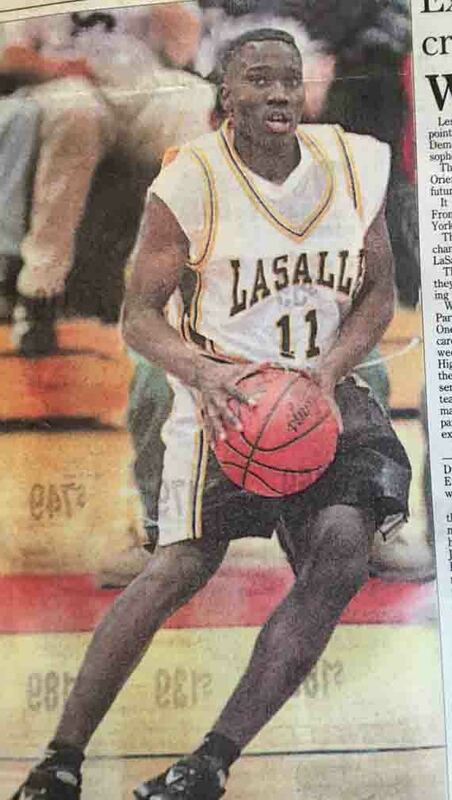 How have players changed since the days you were at LaSalle. I hear they have ‘trainers’ now, and Jason Rowe said everything is on social media. How has basketball changed? TW: Winning has taken a backseat to stats. It no longer dominates the emotion and I don’t know when it went out of style. Your stat-line dictates everything nowadays. In the past, winning dictated everything. You see a ton of players who don’t know how to play the game. Because winning doesn’t dominate the emotion anymore, it’s hard to call a kid on it. When winning doesn’t come first, it’s hard to complain about anything a kid does in a game. To me, that’s the biggest difference between now and back then. Jason and I spent a lot of time together back then. I knew what it meant to him to win. Triple-doubles aside, to not win – we’re from that era where winning was everything. Yes, I had 40 points, but we won. That dominated everything for us. You worked on your jump shot so you could win. You worked on your handle so you could win. Everything was set up so you could be better placed to win the following year. When Jason and his team weren’t winning the Rochester game, I know that he and “Mush” (Damien Foster, pictured below) went to work in the summer so they could win that game. They didn’t go to work so they could come back and average 25 and 30 points – it was time to win a state championship. There’s enough talent back home where they should be winning on a high level, but you can’t make kids approach it like that. AD: You know they say kids today are softer, they don’t communicate the same way. TW: Everyone is friends and that’s one of my biggest pet peeves. I love Jason and he’s my guy. We’ve been friends since he was little. I swear to you that when it came to “checking the ball up”, he was my worst enemy. There’s something missing in competition these days. If you put Jason and me in this era, I don’t think we would be as good. I’m talking about mentally, because we would’ve been too cool with each other. Talent-wise we would’ve killed this day and age, but I think one of the best things we had in us was that we were fierce competitors, would go to war with each other and literally go get a burger later. AD: So, Tim, is this kind of a LeBron James–Kevin Durant type of thing where it’s okay to go make a team versus building your own? TW: Yep, it is. It always starts at the top. The players these kids look up to are all friends. Kevin Durant and LeBron James are really, really good friends. For me, I could never be that good a friend with someone to where it would impact my approach on the court. It didn’t matter who you were, I wanted to go through you on the court; family included, friends included. It didn’t matter; my mother couldn’t get a bucket on me. AD: Alright, two more. For youngsters aspiring to play basketball or to pursue any other life goal, what advice would you give them? TW: If you’re serious about it, treat it like a job. Go to work every day. There’s a ton of kids who have trainers, and to me that work ethic is missing in today’s kids. You know which kids are working from a mile away. If it’s something that you’re serious about dive in, dive all the way in. Don’t dive halfway in and want all the results. There are a lot of kids who will give you 15% effort, but want 120% back in terms of the results. It doesn’t work that way and this is a game you really, really must go to work for. AD: So do you think it’s unusual that they would need trainers? TW: I think it all depends on whose hands you’re in. To me that’s everything. There are a million trainers now, a million guys like Jason Rowe and Mark Price. I would send my kids to them because I know where they’re from. I know them personally and I know their games and their resumes, so I don’t have to question what they’ll do for my kid. One of my biggest pet peeves is kids can’t workout unless they have a trainer. Whatever happened to dribbling the ball down the street to the park? Kids won’t just go to the gym and play pickup ball anymore and that’s the era that we live in. AD: Wow. That is strange. TW: I’ll ask kids, ‘Are you working out?’ They’ll say, ‘I’m trying to get a trainer.’ No! Whatever happened to just getting your ball and dribbling down the middle of the street? One, two, three between the legs. One, two, three between the legs and crossover. I’m all for trainers getting their money, but I must know that it’s on the level of a Jason or Mark training them. AD: Okay, the last question. What did playing at LaSalle for St. Bonaventure and then playing professionally teach you about life and success? TW: For me it was one thing playing in that program. It taught me how to be a young man, and the success of the program made me feel like I could do anything. I don’t know losing, so I approach everything the same way I approached those games back then. I expected to go to Glens Falls, so when I’m in a job interview now, I expect to win. I’m currently at Wells Fargo on the technology side and I expect to win. Playing for LaSalle, I’ve carried myself a certain way all my life because of that experience. It’s confidence, it’s borderline cockiness sometimes. I always believe that if I approach it with the right work ethic, then it’s game over. It doesn’t matter what sport it is. It doesn’t matter what realm of life it is. If I approach it with same approach I used on the court at LaSalle, I’m going to win. Period. And you can ask any of the teammates that I’ve had. It’s just something that’s in you. It just did something to us as kids. We just always believe that we’re going to be alright. AD: Well Tim, that’s all I’ve got, unless you have any other comments or stories, thank you for telling your story. TW: It’s been an honor to speak on this. If you’ve found value here and think it will benefit others, please share it and/or leave a comment. 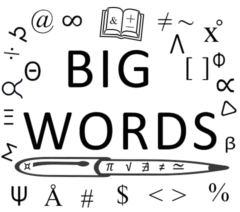 To receive all of the most up to date content from the Big Words Blog Site, subscribe using the subscription box in the right-hand column in this post and throughout the site, or add the link to my RSS feed to your feedreader. Lastly, follow me on the Big Words Blog Site Facebook page, on Twitter at @BWArePowerful, and on Instagram at @anwaryusef76. While my main areas of focus are Education, STEM and Financial Literacy, there are other blogs/sites I endorse which can be found on that particular page of my site.